Research Biologist, author, lecturer and broadcaster. Brian J Ford was appointed Visiting Professor at the University of Leicester in 2006, is Fellow and Member of Court at Cardiff University and a Associate of Gonville & Caius College, Cambridge University, Honorary Fellow of Keynes College, University of Kent at Canterbury and former Fellow at the Open University. He has written over 30 books, most of them on biology and the microscope, on which he is an international authority. Ford’s research has been published in journals including New Scientist, Scientific American, Nature, The Microscope and the British Medical Journal. He has written for The Times and The Guardian. 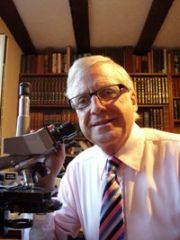 Nature recently described him as the 'world's leading expert' on obtaining images through microscopes, and a search for 'microscope research' on Google shows him to rank top out of 30,000,000 sites world-wide. Intelligence and ingenuity in single cells. Progress of science and technology during World War II. Role of the amateur in scientific development.